As Turretin alludes, even outside of Scripture, pagan philosophers and lawyers throughout history have candidly asserted that the civil government should take care to promote and countenance religion among their subjects as a necessary basis for civil order and law. With the Law of God written upon their hearts, and not entirely destroyed by the Fall, even pagans, though suppressing the truth and redirecting their worship from the living God to created things (Rom. 1:18-24), have “some scintilla, some glimmerings, dawnings, and common principles of light, both touching piety to God, equity to man, and sobriety to a man’s self” (c.f. Psalm 19:1-6, Acts 14:17, and 17:27-28; Rom. 1:18-21, and 2:12-15, 2 Cor. 5:1; Jus Divinum, pg. 9). Their idolatrous worship of that “which by nature are not gods” (Gal. 4:8), however, does not invalidate this argument any more than it would invalidate “public and social worship, stated places of meetings, ministers of religion, with many things of a similar kind, which in such a state of matters are all perverted and misapplied. Rather let us say with the prophet, ‘All people will walk every one in the name of his God; and we will walk in the name of the Lord our God for ever and ever’ (Micah 4:5)” (M’Crie, Brief View of the Evidence…). No sentiment has been more common among all the nations than this, that it is the most important duty of those invested with public authority to pay attention to the interests of religion. The legislators and wise men among the heathen bear united testimony to this truth. In the codes of law established in Greece and Rome, there were laws respecting religion, which were reckoned the most sacred and inviolable. And in almost all nations, not only the civilized, but the more barbarous, ancient as well as modern, the public countenance of religion, with provision for its institutions, has formed, in one way or another, an important branch of their political regulations. These are the dictates of common reason, received and acknowledged among mankind; they are the voice of God, speaking by men of all ages and countries. The principle is further confirmed by the consideration that religion lies at the very foundation of civil society, and that its sanctions and influence are necessary, in order to gain even the direct and immediate end of government, in the preservation of justice and peace among men. From this connection between religion and civil polity, the most enlightened writers on jurisprudence have inculcated it, as the duty of rulers, to give public countenance to religious institutions. Plato asserts that “religion ought to be the principal object of care in every republic” (De Repub.). Aristotle assigns the first place among political duties to “the care about divine things,” De Polit. “The first law of the constitution (says Archytas) should be for the support of what belongs to the gods; the second, for what relates to our parents” (Apud Stobeum). The first law in the Twelve Tables of the ancient Roman institute was, “Reverence for the gods;” and by the laws of the Greeks, blasphemy, the violation of religion, etc. were made objects of punishment. Archaeologiae Atticae, p. 117. Our argument is confirmed, by the consideration that the scripture records approved examples of magistrates who were not Jewish, who exercised their authority for the advancement of religion and the ordinances of God. We find Nebuchadnezzar and Darius publishing decrees to promote the knowledge and worship of the true God among their subjects, and prohibiting them from “speaking any thing amiss against” him (Dan. 3:29; 4; 6:26). 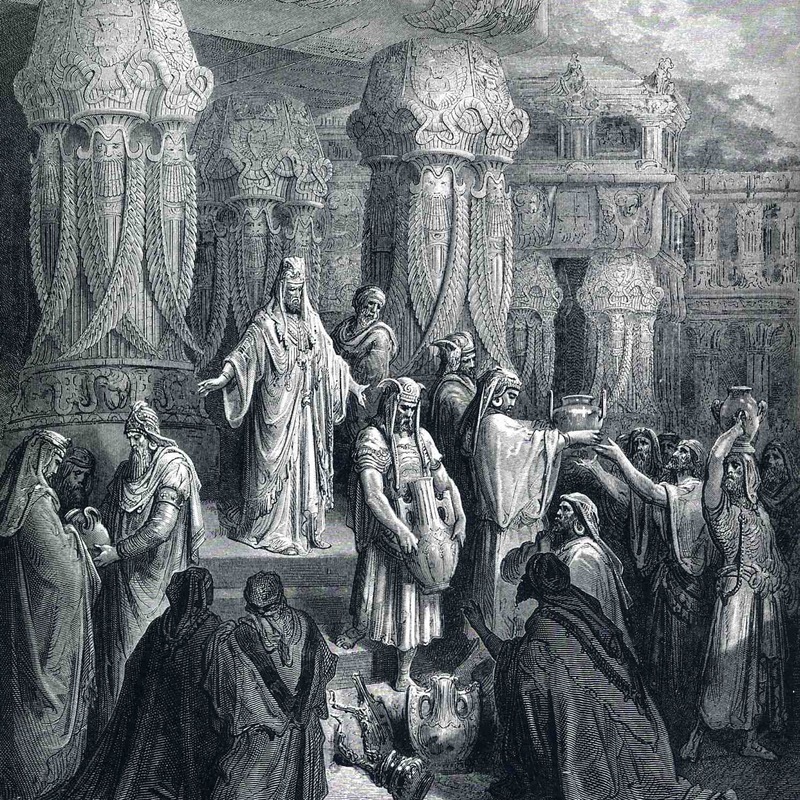 In the books of Ezra and Nehemiah, we have an account of the edicts which several of the Persian monarchs published, in which they not only give permission to rebuild the house of God, and restore his worship in it, but positively favored and publicly countenanced the work, and supported those who were engaged in it. These were not typical kings, nor did they exercise their power in virtue of the Jewish constitution. Even foreigners who were not a part of God’s covenanted people were subject to the sanctions of the law (Ex. 12:49) including first table offenses such as blasphemy (Lev. 24:10-16). Job, living in a pre-Mosaic nation, takes for granted that idolatry ought to be punished by the civil magistrate because it defies natural law (Job 31:26-28). False prophets and adulterers are punished by a pagan Babylonian king who was not a part of the Mosaic so-called “foedus subserviens” (Jer. 29:21-23). The first table of the law is prophesied by Zechariah to be enforced in the future where false prophets and idolaters will be punished (13:1-6). “Righteousness exalts a nation, but sin is a reproach to any people“ (Prov. 14:34) regardless if that nation is Mosaic Israel or not, therefore magistrates have the natural and moral duty to promote righteousness and punish sin according to the Law of God engraved in nature and revealed by the Holy Spirit in the Word of God. That they did this [punished sins against the first table] as Princes of common equity by the law of Nature; I prove 1. Darius who was undeniably no type of Christ to his great commendation makes a Law, Ezra. 6. 11. I have made a decree that whosoever shall alter this word, let timber be pulled from his house, and being set up, let him be hanged thereon, and let his house be made a dunghill for this; and this is commended by the Holy Ghost, v. 14. They prospered through the prophesying of Haggai, etc… according to the Commandement of the God of Israel, and according to the commandment of Cyrus and Darius, and Artaxerxes King of Persia. And Ezra chap. 7. Artaxerxes saith v. 26. Whosoever will not do the law of thy God, and the law of the King (enjoining obedience thereunto) let judgment be executed speedily upon him, whether it be unto death, or unto banishment, or to confiscation of goods, or to imprisonment. And Artaxerxes was no type of Christ, yet Ezra addeth in the next verse, 27. Blessed be the Lord God of our Fathers, which hath put such a thing as this in the heart of the King, to beautify the house of the Lord at Jerusalem. If it stand good that patrons of liberty say, he was not to bless God for this, he had cause to mourn, that the heathen King being no type of Christ, should intermeddle with that which belonged not to him, to strain the tender consciences of men, and to force Religion upon them with the sword; for chap. 10. v. 7, 8. this is set down as a blessed decree which brought on an Assembly, for putting away strange wives. The like is clear in the decree of Darius, Daniel 6. for worshipping the God of Daniel, and of the King of Nineveh, for a general fast, Jonah 3. and Nebuchadnezzar, Dan. 3. 28, 29. A Free Disputation Against Pretended Liberty of Conscience, pg. 181. So what punishment should be given to those who violate the first table? Death? Prison? Fine? Next Post What is National Covenanting?